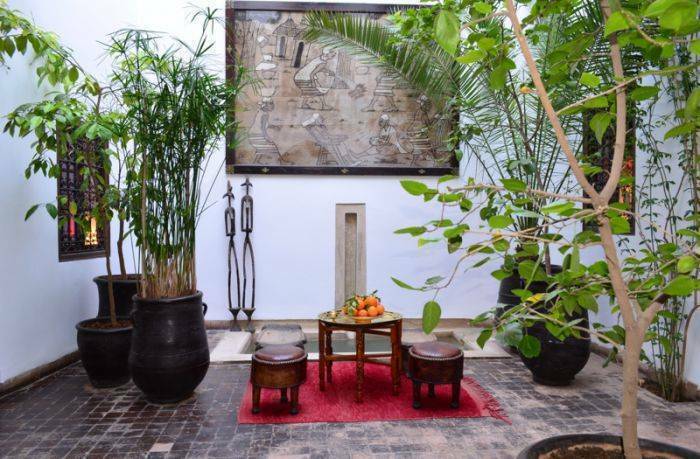 Marrakech Riad Dar Zaman is a stunning mixture of ancient and modern nestled at the end of a peaceful lane in the heart of the magical Marrakech medina. Our Marrakech Riad is ideally located less than one mile north of the main square of Jemaa el Fna, close to the souks and Medersa Ben Youssef. 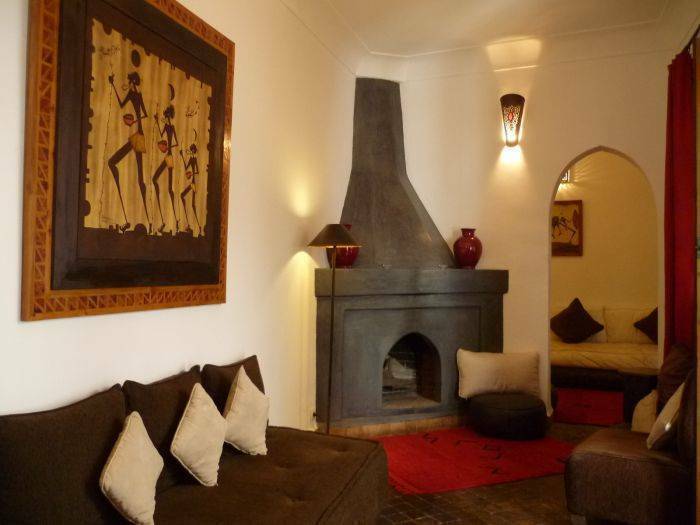 Marrakech Riad Dar Zaman is within easy walking distance of all the main attractions. We are just minutes from two of the best Marrakech restaurants, Dar Zellij and Dar Yacout, with easy taxi access. Dar Zaman offers four uniquely designed double en-suite air conditioned rooms (La Carbone and La Douiria rooms can have twin beds), equipped with hairdryer, digital safe and complimentary luxury toiletries. Dar Zaman has an interior courtyard and two sitting rooms with open fireplaces, the perfect setting for a romantic dinner on a winter evening. A smaller sitting room is equipped with satellite TV, high speed wi-fi, a small library and a selection of board games. The roof terrace is perfect for catching some sun, with views over the Marrakech medina rooftops to the Koutoubia minaret and the stunning snow-capped Atlas Mountains on a clear day. For the hot summer months our Marrakech Riad has a deliciously cool dipping pool in the courtyard. 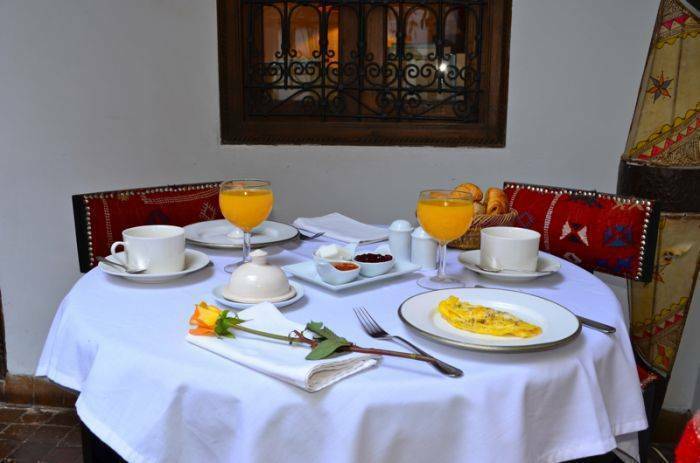 A sumptuous Moroccan breakfast is included in the room rate – a wonderful choice of fresh bread, croissants and pastries from the baker at the end of our street, crepes with jam, homemade yoghurt, eggs, fresh fruit, freshly squeezed orange juice, and tea and coffee. Our aim at Marrakech Riad Dar Zaman is to enable our guests to experience the Marrakech we've come to know and love over the last 5 years. We have a fantastic, hard working multi-lingual team who are ever present yet discreet, helpful and kind. They will happily share their excellent knowledge of Marrakech with you - they know where to buy spices and quality leather at a fair price, where to get the best spa treatments, where to take your cooking class (at Dar Zaman! ), and where you can eat a tagine seated metres from a stunning waterfall in the Atlas Mountains. Whatever your needs in Marrakesh, we can help plan all aspects of your stay. We recommend all guests have dinner at least once at Dar Zaman – Karima creates the most delicious Moroccan dishes that you’ll swear afterwards were the best you ate in Marrakech! Mint tea is complimentary for all guests – all day long. The staff will happily share the recipe and show you the traditional way to make it. 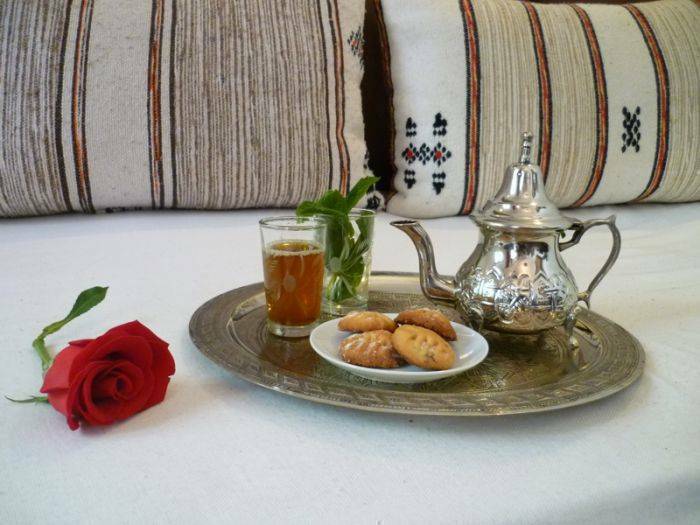 We think Marrakech Riad Dar Zaman is one of the best riads to stay in Marrakech. Don't just take our word for it though, read our reviews on Trip Advisor and see what other guests say about us! We have four magical en-suite bedrooms at Marrakech Riad Dar Zaman. Each of them has a unique feature, all of them are equally charming. All are equipped with air conditioning, heavenly queen size beds and adjoining shower rooms, beautifully finished in polished tadelakt. Designer toiletries are provided, together with hairdryers. 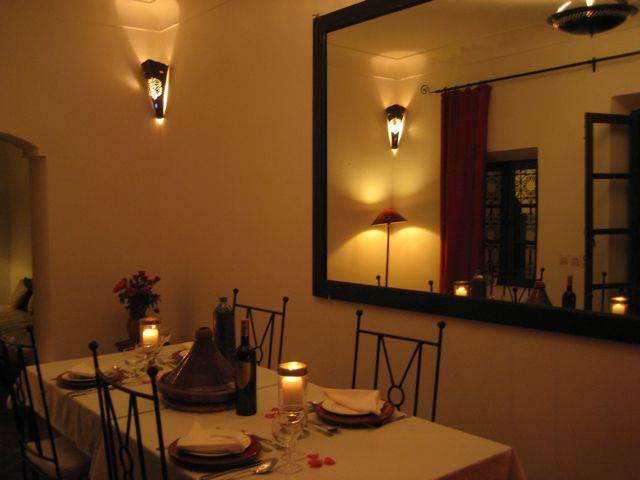 Dar Zaman is situated north of the Place Jemaa el Fna in the neighbourhood of Sidi Ben Slimane. 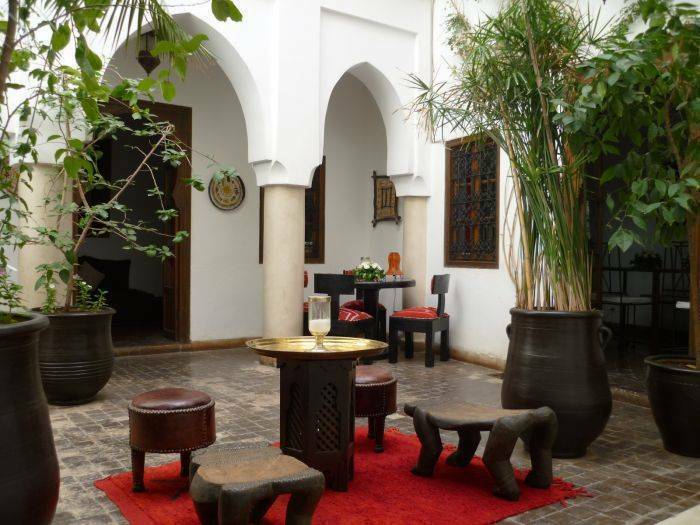 The area is residential, not touristy, although there are several other riad guesthouses nearby. There are souks and artisan workshops 2 minutes from the riad. The main souks are 10 minutes away through the ancient medina. Order dinner in the morning for same evening. Delicious Moroccan cuisine prepared by Karima. An additional deposit may be requested prior to arrival. If so, you will be contacted directly after you confirm your booking. After making your online reservation we will contact you to take a deposit of 50%. The remaining balance is payable in cash or Visa/Mastercard (+4%) at riad. Reservations within 30 days of arrival require payment in full. remaining 50% due 14 days prior to arrival. deposit/total paid less 40 euros fee. Less than 21 days before arrival (28 days high season) - non-refundable. We're an easy 20 minute taxi ride from the airport, in the northern part of the medina. The most efficient way to get to the riad is to let us organise a car and driver to meet you. We'll then meet the taxi and guide you to the riad. The cost of the transfer is 15 euros.